I hadn't been on the ocean in a while. So today, even though I was a bit worn out from many hours of karate practice and yard work yesterday, I was drawn to the high tide outside my window this afternoon. I initially set off with a destination of the Jametown Bridge. I figured after I got there, depending on the amount of daylight left, I might be able to make it to Dutch Island. 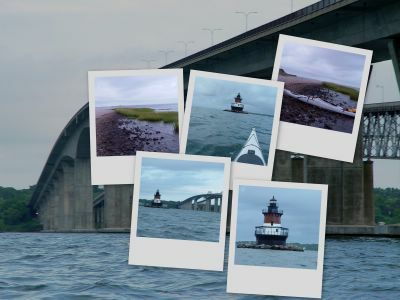 By the time I paddled out to the bridge, the tide was starting to go out, so it would have been a fairly easy paddle to Dutch Island (going with the tide), but then I would have been going against the current all the way home. Not the best thing to do when you are tired... So, I instead decided to just paddle out to the Plum Beach Lighthouse. It's basically in the middle of the west passage of the bay, right next to the Jamestown Bridge. If you ever drive over the bridge heading towards Jamestown, you can see the lighthouse off to the left. I took a few pictures along the way. There are a few of them in the collage above. If you click on that photo you can get a better view of the collage. The rest of the photos can be seen here. If you follow this link, you can see a Google Maps view of where the lighthouse is. If you keep zooming in (click on the + sign in the upper left of the map), you will see the lighthouse. It is is in the center of the map view. When looking at the map before zooming in, my condo is in the small cove in the mid-upper left (where the arial photo view border turns green).